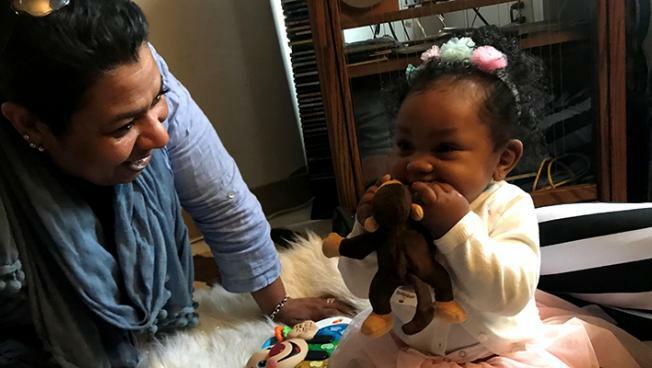 Infant educator Alex DaSilva encourages six-month-old Mackenzie to crawl and talk. The Boston Basics team is excited to share the story on the Basics that aired on Tuesday 4/17 on WGBH Radio News. Go to 89.7 online to listen to this short piece (3:34). Reporter Bianca Vasquez Toness recorded the Basics being used during a home visit by Alex DaSilva, home based specialist at The Dimock Center, and interviewed Basics founder Ron Ferguson* on the importance of "Maximize Love, Manage Stress,” the first of the Basics. He points out that you can’t spoil a child by holding her too much; warmth and responsiveness helps babies to feel emotionally secure and gives them the confidence to learn. A shout-out of appreciation goes to our partners The Dimock Center and WGBH for helping to make this interview possible. We hope you enjoy the story. Thanks for continuing to help us spread the word about the Basics and the critical need to share these practices with parents in Boston and beyond.